When they discover what hunting really is, the French reject it on mass! Is this the end of an omerta (code of silence)? According to the results of the last IPSOS survey commissioned by One Voice, the French know very little about the reality of hunting, lulled by illusions of the hunters' lobby and their self-proclaimed image of field ecologists. The reality is different, and our fellow citizens, like us, do not want it! Cruel, belonging to the past and dangerous for them, their relatives and their pets, the French have a bad image of hunting. They recommend better supervision of this practice, a ban on hunting during the entire school holidays and two days a week including Sunday (82%). Three-quarters of them, moreover, have a very negative view of the presidential gift of the drop in the price of the hunting license. But more than that, they do not know what types of hunting are still practiced in France and how. And when they discover it, aghast, they cannot tolerate these practices any longer. The most popular rhetoric, that of the tradition preached by the hunters consists in presenting their hobby as having utility, using the of best terms such as "regulation", "culling" etc. But they never communicate their methods, conditions and places of killing animals. This is the main problem. Because in a democratic country like ours, it is important that information is circulated so that citizens can make informed choices! Breeding for hunting, digging of setts and dens, hunting with hounds, cruel traps: rejected! The people want to stop cruel practices such as raising animals for the sole purpose of killing them, digging of setts and dens while nocturnal animals are sleeping and forcing them out with dogs. They strongly reject the hunt (82%), which has made so much talk about this subject since last year. 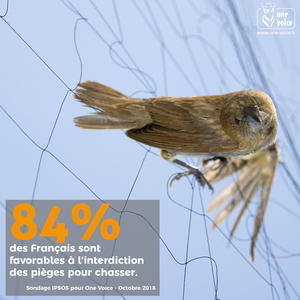 More than eight out of ten French people no longer want these glue and net traps, these killing traps, which not only kill but cause pain, and which do not distinguish between the endangered species and others. 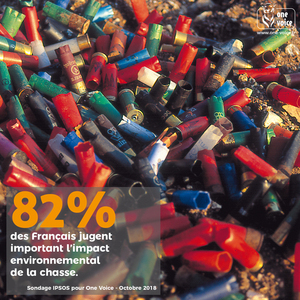 When people learn that the rifle cartridges represent more than 6000 tons of lead and plastic spilled on the wetlands and in the forests of France, the deleterious impact on the environment can no longer be ignored. They obviously condemn them. Finally, 9 out of 10 French people are unaware that animals can be killed during the breeding season, and hunted in national parks, nature reserves or biological reserves, and they themselves are as much to want these practices! How is it that political decisions do not follow the opinion of the people? Empathy is a vital force that needs to be strengthened, the coexistence on our planet of humans with animals should be a prerequisite for any reflection on the rest. Instead, it is all about absurd and deadly traditions, while all signals are red regarding the environment and the animals that populate our blue planet. We will be with more than 40 partners in Paris this October 13th, to demand a major and in-depth reform of hunting, pending its ban. Please sign our petition and join us! Blog | When they discover what hunting really is, the French reject it on mass!